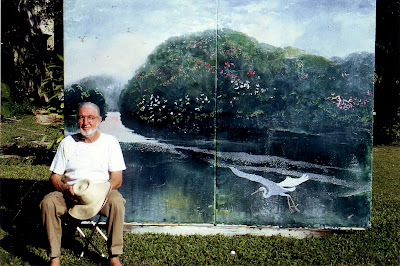 This Friday, March 7 at 7:30 pm, our regional treasure, Fred Hunt (shown here in front of his Panama Embassy piece), will be honored with a surprise birthday party. All those who have known him since he came to the Grove are welcome. Artist friends, collectors, neighbors -- all are welcome to celebrate his long life. Many know he has been battling cancer. He has decided not to continue traditional treatment. The party is at The Windisch-Hunt Gallery (2911 Grand Avenue). The door will be open but will say "closed", please just enter and proceed to the back of the gallery. I am told that Fred won't see this post before the party, so please don't mention it to him if you see him around.